A journal of my adventures in the fiber arts. I've played with different wool and fibers, plus different types of weaving, knitting, spinning, felting and more. I tend to gravitate toward primitive types of fiber projects. Here is sprang #3, with more practice, my eyes and my fingers are getting used to movements and patterns needed for this basic weave pattern. Here is sprang #6, becoming more familiar with the movements and where the strings need to overlap for the weaving to work. I have 24 warps on it now. Will start some wider pieces with a long board soon. 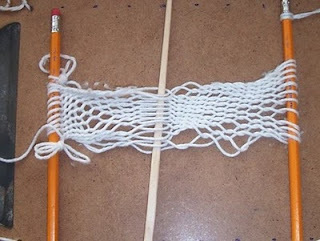 I've used string to pull the weaving wide for taking the photo. I've also drilled some holes in the clipboard to anchor the sticks. Egyptisch Vlechtwerk [Sprang], Holkema & Warendorf, 36 pages. with photos. Also photos of currently interlaced pieces from classes. I don't read Dutch, but there are dozens of excellent pictures. The book was scanned as picture so I can't put the text into a translator without typing it all in. 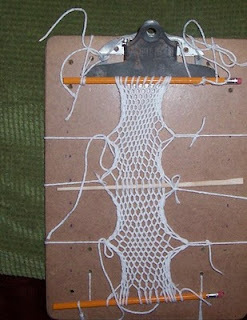 Clever clip board loom. Great links too. 8-] Thanx for including my site. Thank you Ellen for visiting my little blog. I hope you like the other stuff too. Harrisville Lap Loom - Size A 12" X 16"
Spring is almost Over?!! Because it already feels like summer here in the South West! !